A while back I had an idea for a future book that I probably will never write and perhaps should not: joy. Or rather joy! Surely an emotion that exuberant merits an exclamation point, if not a whole bunch of them. Growing up, I distrusted the concept of joy. As an inveterate Midwesterner, I distrust emotional intensity of any variety, but I was particularly suspicious of joy. It seemed impossible to attain, let alone hold on to. It was inherently ephemeral. I viewed even glancing moments of happiness as mere preludes to shattering disappointment. Joy represented something even more inevitably devastating. Joy was like a weird friend who stops by to visit every three or four years for five or 10 minutes at a time, then disappeared mysteriously. Joy is the antithesis of sneering cynicism, of the smug, ironic detachment that has become the default posture for so much online chatter. Genuine joy is a rare and wondrous quality in popular entertainment. I suspect part of the reason Yo Gabba Gabba, Girl Talk,and LCD Soundsystem are all so beloved is because they Trojan-horse joy inside hip packaging. In doing so, they trick cynics into actually experiencing happiness. Girl Talk captures and re-contextualizes the infectious exuberance of Top 40 radio into pop-art pastiche. LCD Soundsystem makes dance music for people who’d otherwise think of themselves as too cool to dance. And Yo Gabba Gabba taps into everyone’s inner child in a way that doesn’t inspire mass projectile vomiting among sophisticated sorts. On a similar note, I’ve come to love country in part because it’s such a potent vessel for expressing joy. As I’ve argued earlier, there is no purer vehicle for joy in the history of American music than Bob Wills’ ad-libs. Country covers a staggeringly broad emotional spectrum that runs the gamut from suicidal depression (see the entire oeuvre of Gary Stewart) to rapturous joy. Country has never been afraid of emotion. The Avett Brothers’ music is characterized at once by aching sadness, infectious joy, naked sincerity, and raw emotion. I first learned of The Avett Brothers—a critically acclaimed bluegrass-y outfit that emerged from the ashes of brothers Scott and Seth Avett’s college group, Nemo, to become a major musical force and an opener for such unworthy superstars as Dave Matthews Band, Widespread Panic, and (egads) John Mayer—when my girlfriend played me this YouTube video in a scenario that played out exactly like that one scene in Garden State. I think I may even have been wearing my Zach Braff life mask at the time. (Yes, I have a Zach Braff life mask. Don’t ask, it’s a long story.) I was impressed and vowed to listen to more Avett Brothers imminently. Then I got distracted for the next 14 months or so. It’s an achingly sad, almost painfully intimate song blessed with humor, tenderness and a strange grace. 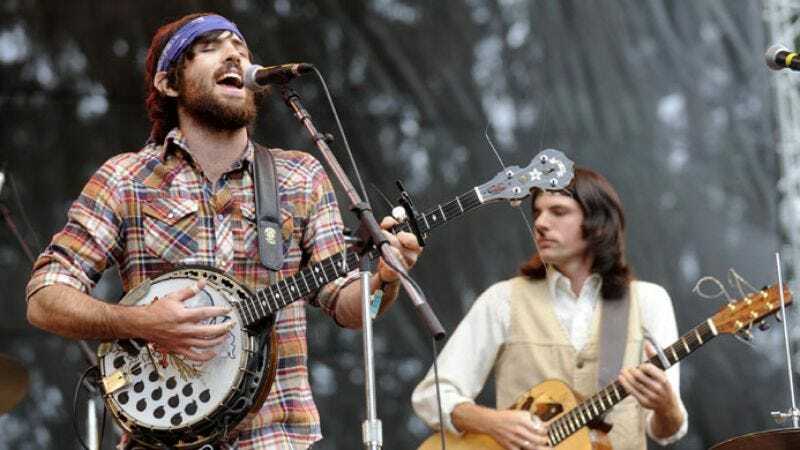 Like the Louvin Brothers, the Avett Brothers have a spooky musical connection; they’re like those creepy twins who read each other’s thoughts and furtively plan to murder adults, but in a good way. The bonds of blood and brotherhood seem to matter more in bluegrass, the domain of The Louvin Brothers, The Everly Brothers, and The Delmore Brothers, than they do in other genres, perhaps because the genre places such a high premium on harmony, musicianship, and collaboration. It seemed poetically apt that my introduction to these gifted, beautiful brothers was a song about brotherhood. Where “Murder In The City” is mournful and sad, Country Was, The Avett Brothers’ 2002 debut album (it was preceded by an out-of-print 2000 self-titled EP) is nonetheless distinguished by a pervasive sense of joy and optimism. It’s messy and vital in the best possible way. Brothers Scott and Seth can be extraordinarily elegant, delicate singers, but on songs like “Pretty Girl From Matthews,” they often let their voices bleed together in a hoarse, passionate appropriation of musical ecstasy. “Me And God,” from the 2003 album A Carolina Jubilee, is The Avett Brothers’ wry take on spirituality and Tom T. Hall’s “Me And Jesus.” Here, the Brothers sing of a preacher friend who is a “real good man” but “me and God don’t need no middle man.” It’s a song that simultaneously illustrates the group’s generosity of spirit—it praises the purveyors of Jesus’ message while politely refusing their assistance—humor, and swooning romanticism. Reflecting on some of the more secular effects of God’s benevolence, the brothers sing “I found God in a soft woman’s hair / A long day’s work and a good sitting chair.” And how can you not love lines like “I don’t know if my soul is saved/sometimes I use curse words when I pray,” especially when delivered with such impish aplomb. The Avett Brothers convey boundless joy even when singing of boozy heartbreak. “Pretty Girl From Raleigh” is infectious and toe-tapping even when contemplating an agonizing break-up a long time in the making; killer one-liners like, “So bye, bye, bye / I ain’t got time to watch you cry / I’ve been drinking seven hours now / Sympathy is a waste of my high” certainly don’t hurt. Catchy songs about grim subject matter are one of A Carolina Jubilee’s specialties. Take, for instance, “I Killed Sally’s Lover,” an up-tempo ditty about, naturally enough, murdering a girlfriend’s lover. 2004’s Mignonette is a concept album about a real-life incident in which the survivors of an 1884 yachting accident were forced to eat the cabin boy to stay alive. It would be hard to imagine grimmer subject matter, yet the album is tender and full of life instead of morbid or depressing. “Nothing Short Of Thankful” is a shot of audio adrenaline driven by the brothers’ playful back-and-forth, “At the Beach” is an almost psychotically cheerful number filled with gleeful whistling, and “Hard Worker” is a gleeful celebration of endless toil. Leave it to The Avett Brothers to find the life, hope, humor, and energy in a historic tragedy. With the exception of George Jones, it would be difficult to imagine a group more entitled to name an album Emotionalism. Sure enough, the album is another heart-on-the-sleeve winner that leaps from highlight to highlight, from the stark, minimalist beauty of “Shame” to “All My Mistakes,” which is quietly profound in its exploration of the good things that can come from our bad decisions and terrible choices. “Tin Man” derives its kicky new-wave power in part from the inherent contradiction of the words of a man incapable of feeling emotion being sung in such a passionate and forceful manner; if anything, The Avett Brothers feel things too deeply. On “A Gift For Melody Anne,” the brothers sing, with signature conviction, “Lord, I just want my life to be true / And I just want my heart to be true / And I just want my words to be true” before reflecting, “I want to stand up and I want to stand tall / If I ever have a son, if I ever have a daughter / I don’t want to tell them I didn’t give my all.” They needn’t worry: The Avett Brothers don’t just sing those words; they live them. In doing so, they give former cynics like myself permission to experience joy, pain, heartbreak, infatuation, and everything in between.